Living The Artist's Dream: Life Is Too Short.. The older I get I find, as you do also, life is too short. Too short for things to be done, too short for things you want to do and too short to hold onto a hurt, real or imagined. A friendship was repaired today and for one, I am happy. I'll just say, life is too short. I met an artist friend for lunch in Palm Bay where we had lived with gossip and laughs and..great food. After lunch we went through Goodwill, one of our fun haunts, but nothing that I truly needed to bring back to CiCi Blue. Then I'd have to figure out where to put it. Sigh. 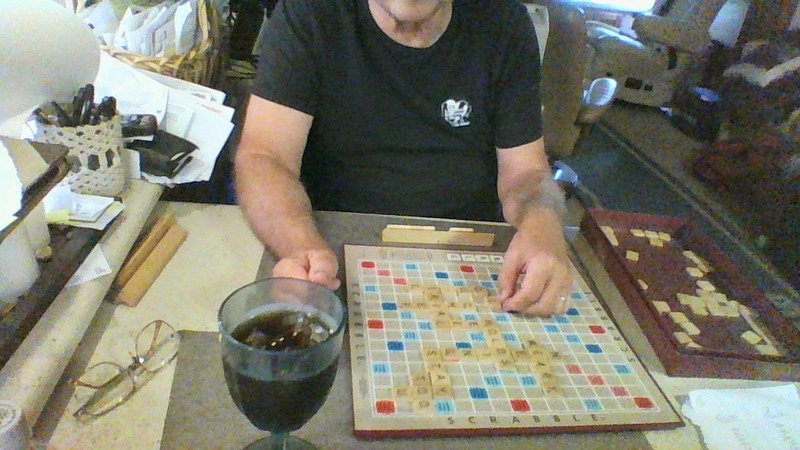 I returned about 4:00 P.M. and Roger and I had another rousing game of scrabble! Looking at this photo now I'm seeing clutter..oh-oh. It needs to find homes tomorrow. Ah, life in an RV. I'll be finishing up the comics tomorrow and a couple of paintings. Just need to tie myself to my little easel and get it done! The Book Fair is a month away and the book needs to have a proof sent, then ordered. I can do this!!! Ok, going to fight one of the dogs for space on the couch!!! Have a great night!